Apple’s iPhones are always among the hottest gadgets of any holiday shopping season, but for one passenger on an Australian flight, the phone was too hot to handle — literally. While on Australian flight Regional Express ZL319 Friday, a passenger’s iPhone 4 (not the iPhone 4S, which is Apple’s latest model) suddenly started “emitting a significant amount of dense smoke, accompanied by a red glow,” according to a Regional Express statement. The plane, which was flying from Lismore to Sydney, was in the midst of landing when the incident occured. “In accordance with company standard safety procedures, the flight attendant carried out recovery actions immediately, and the red glow was extinguished successfully,” according to Regional Express’ statement. 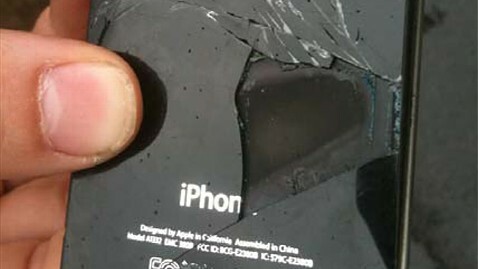 After landing, the iPhone was handed over to officials at the Australian Transport Safety Bureau. There’s no official word yet on what caused the phone to combust. Exploding Apple products are rare, but explosions have happened in the past, mostly related to the devices’ lithium ion batteries overheating. The European Union launched an investigation in 2009 after multiple instances of iPhones and iPod Touches exploding or catching fire midflight were reported in the U.K., Holland, France and Sweden. Apple also recalled its first-generation of iPod nanos sold between September 2005 and December 2006 because the battery would overheat and “pose a safety risk,” according to the company’s website.